Review our entire line of temperature indicators and recorders to identify the best solution for your cold chain. Temperature indicators and recorders introduce accountability measures into the shipping and handling stages of the temperature sensitive cold chain. In the event that a temperature excursion occurs, indicators and recorders give you the data needed to improve the integrity of the cold chain. What is a Data Temperature Logger? 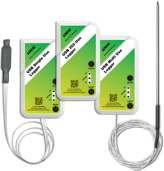 In simple terms, a data temperature logger is a portable instrument designed to be able to the sense and record temperature in both indoor and outdoor environments. They are used in a wide range of ways but it is in the supply chain where they are most found and where they serve a bigger function. To serve their purpose, temperature monitors consist of two main parts - the temperature sensor (or sensors), and the recording system. The recording system picks the temperature measured at preset intervals and saves the measurements. The design of the internal sensor and data logger is dependent on the model, however, for most in-transit purposes, the data temperature logger has both the sensor and the data recorder integrated to make one device that is both compact and light in weight. The use of a temperature logger provides a record complete with time stamps of the various conditions the products have been exposed to. While it helps the recipient of the good to certify that the goods were maintained in required conditions, it also helps identify any inconsistencies. This is especially true in the case of storage facilities. On the part of the transporter, a data temperature logger acts as evidence in case of any claims of mishandling arising. The one downside to this type of logger is that at the end of the shipment or journey, the data must be retrieved. An analyst can connect the monitor to a PC and download the data with a USB. More advanced models allow the use of a wireless network to transmit the measurements, which eliminates the need to obtain data from the field directly. Single-use temperature monitors are another option in the supply chain cycle that are efficient and simple to use. These are strips or simple attachments designed to indicate when a temperature has gone above or below a certain point. Some models can also indicate the time range outside of the ideal temperature. A number of industries require that their products be kept within set temperatures. These products include food, chemicals, pharmaceuticals, blood for medical purposes, and floral products. Exposure to temperatures outside the required range for long periods can damage the products, reduce their shelf life, and even cause the development of toxins and pathogens. During pasteurization and food canning, for example, the foods must attain required high temperatures over a prolonged period to avoid deadly Clostridium botulinum, the toxin responsible for botulism. During storage and movement, especially when shipped, processors mostly require cool environments or even refrigeration. Grocery stores and restaurants now require that the foods they order, especially foods like raw meats and fish, come equipped with temperature indicators. When the delivery truck pulls in, someone from the store physically inspects the indicators to ensure that the product did not fall outside required temperature ranges for food safety. If foods stay too long outside of the safe temperature zone, bacteria growth and spoilage occurs. Should a shipment not meet the requirements, most contracts allow for refusal of the shipment which is a loss to the processors and manufacturers. Within grocery stores and restaurants, the same food safety temperature holding conditions apply. So, they can use temperature indicator strips in deli cases, on buffets, and in refrigerators to ensure equipment is working properly to keep foods hot or cold. The more a facility can show they have multiple layers of protection in their food safety program, the better protected they will be should an outbreak occur. 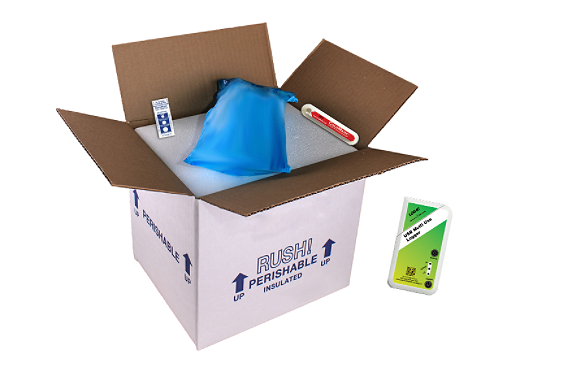 Medical supplies need cold temperatures for their storage throughout their life cycles as well. Blood, transplant organs, certain medications, tissue samples, and a wide variety of other medical products have extremely strict temperature control regulations. Paintings and sculptures are also products that are sensitive to the temperatures in their environment as both humid and hot temperatures easily affect them. Warmer temperatures can cause flaking, bubbles, melting, and warping while colder temperatures can result in cracks. 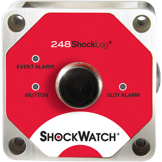 The ShockWatch WarmMark Duo is an affordable temperature indicator ideal for monitoring temperature during shipping and storage. Its main feature is the dual time and temperature indicator. This allows it to indicate the duration at which a product was exposed to different temperature activation levels. It is also disposable and can monitor temperatures above 10 degrees Celsius and briefly those above 34 degrees Celsius. The WarmMark is a single use indicator which monitors the temperature in ascending levels. This way it alerts the user whenever the product exposure goes beyond the threshold conditions. It is available in nine different temperature sensitivity levels to select the one that best suits your purpose. This aspect allows it to be suitable for both low and high-temperature threshold needs. 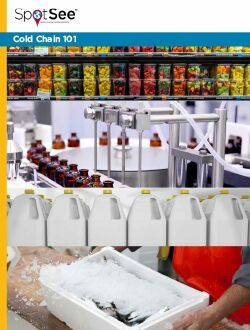 It serves a range of industries from floral to pharmaceutical to food processing and delivery. As the name suggests, the Blood Temp 10 temperature logger is made specifically for use in blood storage and transportation. It meets all FDA and AABB requirements and does not need any special handling. It is cost effective and easy to interpret with an irreversible alarm system. ColdMark is also a single use temperature indicator specifically designed for cold chain use. It alerts users when the temperature goes below a set threshold by turning violet from its initial clear color. This is a reliable and low-cost temperature logger that also serves cold chain needs. Besides alerting users when the shipment has been exposed to temperatures beyond a set value, they also contain wireless capability for faster transmission of data. Take the time to learn more about SpotSee, temperature sensors, and the full range of monitoring and impact products we create to provide the data and reliability you need. Our products range from tilt indicators like the TiltWatch® XTR to a handful of shock sensors to fulfill any impact monitoring needs!